be fired while held in the hand, and long guns are designed to be fired from the shoulder. 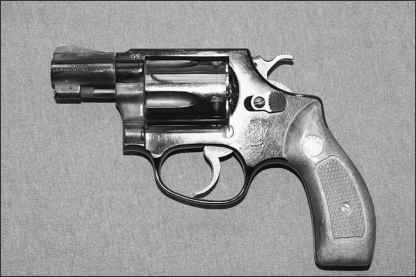 Handguns include revolvers and pistols, examples of which appear in the accompanying photographs. 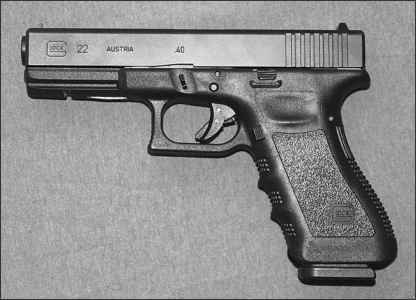 Pistols are either semiautomatic (auto-loading) or fully automatic (machine pistol). The difference is that a semiautomatic pistol requires that the trigger be pulled for each shot, while a fully automatic continues to fire until all its ammunition is expended once the trigger is pulled and held. Pistols use magazines, sometimes erroneously referred to as "clips," to feed cartridges into their actions. Revolvers rely upon a rotating cylinder to hold cartridges and place them into a firing position. Revolvers are classed as either single action or double action. Single action means that the hammer must be manually cocked in order to fire the weapon. Double action means the hammer is cocked and the cylinder simultaneously rotated as the trigger is pulled. 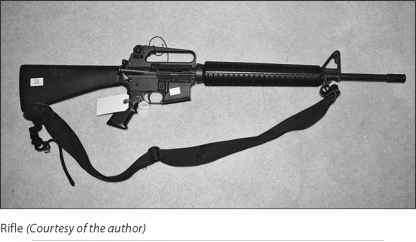 Pistol actions function by stripping a cartridge from the magazine, seating it in the chamber, firing the cartridge, extracting the fired cartridge case, and ejecting it from the weapon. Each of these events potentially leaves identifiable tool marks on the cartridge case. guns are capable of fully automatic fire. The difference between machine guns and submachine guns is that machine guns fire rifle cartridges and submachine guns fire pistol cartridges. Examples of a typical rifle and shotgun are shown in the photographs. Handguns and long guns, with the exception of most shotguns, have spiral grooves cut or formed into the interior surface of the barrel. These grooves, called rifling, are designed to impart a spin to the bullet as it moves down the barrel upon discharge of the weapon. 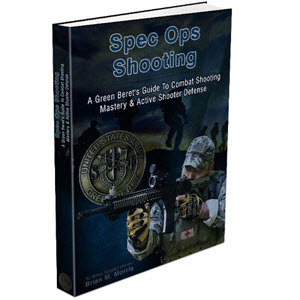 This spin stabilizes the bullet in flight to improve accuracy and increase the effective range. The areas between the barrel grooves are known as "lands." 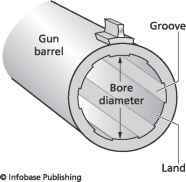 There are an equal number of lands and grooves in a gun barrel and typically ranges from two to 16. The grooves in the interior of a gun barrel are best described as in the shape of a helix (see the illustration on page 8). Various methods are used to create the rifling. Traditional methods involve cutting using hooks, carbide buttons, or broaches, while more recent methods rely on hammer forging or electrochemical etching. The direction of twist of the lands and grooves may be either clockwise (to the right) or counterclockwise (to the left). The number and widths of lands and grooves, the direction of twist, and the degree of twist are among the class characteristics of a given make and model of weapon. Degree of twist is the rate at which the rifling creates bullet spin per unit length. Common rates of twist for small arms would be 1:12 or 1:14 in regards to the number of bullet revolutions per inch of barrel length; in other words, one turn in 12 inches (30.5 cm) versus one turn in 14 inches (35.6 cm) (even though the barrel may not actually be that long). calibers of the weapons that fire these cartridges are all essentially the same, however. Caliber determination is illustrated in the diagram. Shotguns, on the other hand, are usually smooth bore (without lands and grooves). Since shotguns usually fire small spherical pellets, they do not need the spin stabilization provided by rifling. Shotguns may also be used to fire "slugs" (single, large projectiles), in which case spin stabilization is desirable. This may be accomplished by having spiral grooves cast into the body of the slug itself. There are also shotguns with true rifling in the barrels. Rather than by caliber most shotgun barrels are distinguished according to "gauge" Commonly encountered gauges include 12, 16, 20, and 28. The gauge designation is a holdover from old English terminology. Gauge represents the number of lead shot of a particular diameter to the pound. Thus, a 12-gauge shotgun barrel has a diameter such that 12 lead shot of that same diameter would weigh one pound. Since a 16-gauge shotgun represents a barrel diameter equivalent to 16 shot to the pound, a 12-gauge shotgun has a greater diameter than a 16-gauge, which is greater than 20, and so on. The exception is 410 shotguns, which are actually designated as to caliber (0.410 inch [1.05 cm] diameter) rather than gauge.